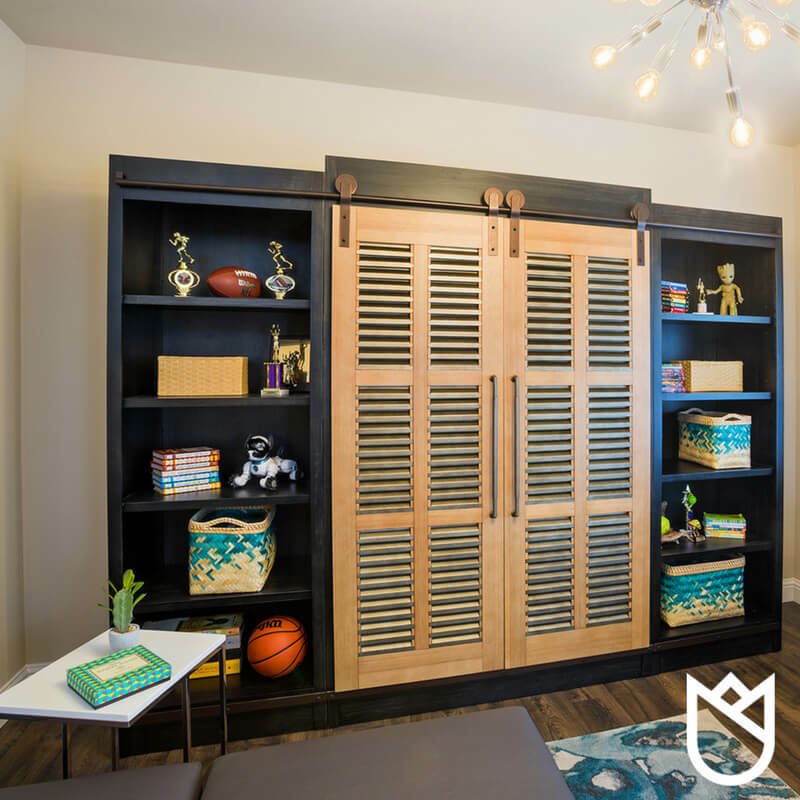 House Tour: Children’s Game Room — KTJ Design Co.
We’ve worked with Kraig and Alissa to furnish their entire new home, and the last room we finished was the game room for their four children. We designed it so that it would be appropriate for all ages, especially since our young clients’ ages spanned from 6 to 13. Kraig and Alissa wanted a place for their kids to play video games and hang out with friends. 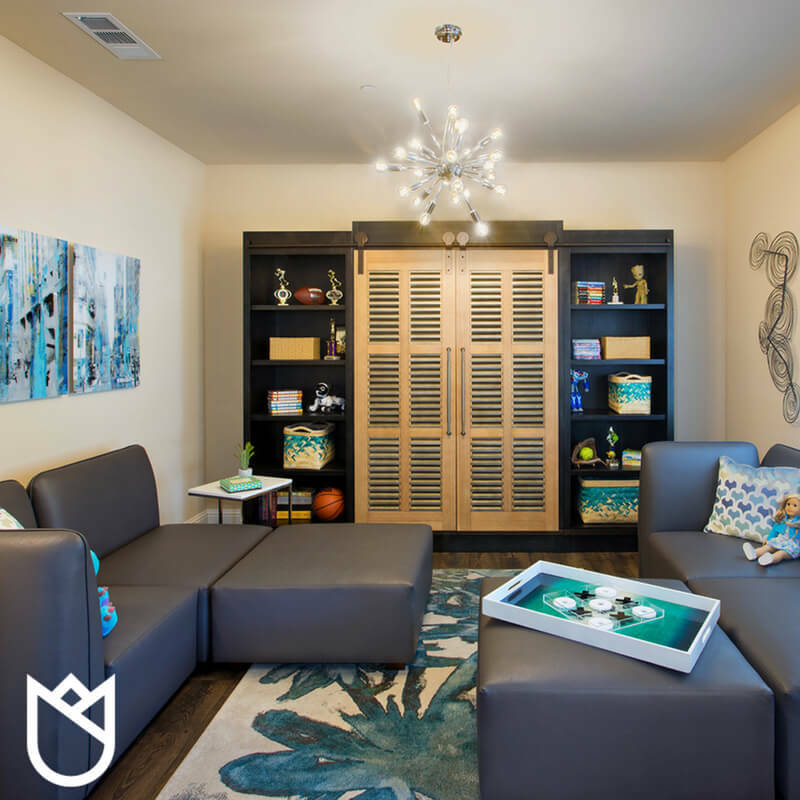 To accomplish this we picked a modern entertainment center, shelves to hold their treasures and trophies, durable seating, a colorful rug and lots of fun artwork. It’s a dream come true for these four kids (and I hear it’s the best hangout on the block). Playful colors and patterns make this room a truly happy place. We selected this entertainment center and used barn doors to hide the TV and game equipment. We also specified modular furniture with comfortable, washable fabric. When we presented our ideas to Kraig and Alissa, we showed them all six ways the seating could be arranged. This flexibility is perfect for games and sleep overs. We were sure to add colorful basket organizers. When Mom announces bed time at the end of the day, clean-up is a breeze for everyone. 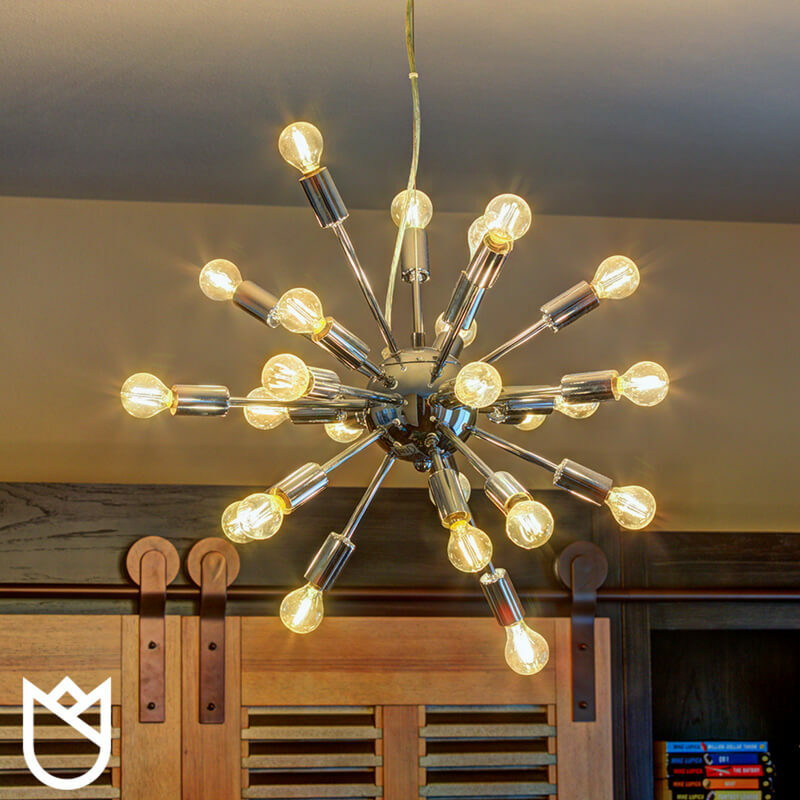 We added a Sputnik chandelier (because we love a good chandelier!) to give the room a hint of disco ball vibe. We couldn’t be happier with the results of this game room, and the real rewards came when we returned a few weeks later to drop off a few last items. The game room was full of my clients’ kids and neighbor kids. They had re-arranged the seating and were having a good time. Just seeing that made me smile all day long. Now, what about your project? Finding just the right furniture for any type of room is critical. Knowing which materials are the best for each space is our first priority—kids and pets have met their match at KTJ Design Co! Call us to find out how we can help you get the home you want for the family you love.